A place to cache miscellaneous stuff on this subject, for later use perhaps. The Iron Cabal: Skip Williams, Lee Sauder, Elizabeth Knapp, Ken Koons, Steve Riethmiller, John Blackburn, myself... The idea is to gather practical, theoretical and historical materials on small-scale iron making, considering the processes and materials of iron production in Rockbridge and nearby counties in the last 200 years or so. John McDaniel and James Hepner are going to Gibraltar Furnace, looking for "cultural toolkit" of 1850s, looking for who lived where and so on. Finery, not a forge. Mike Upchurch is the person wandering around doing surface surveys of ore deposits for ?Dept of Natural Resources? 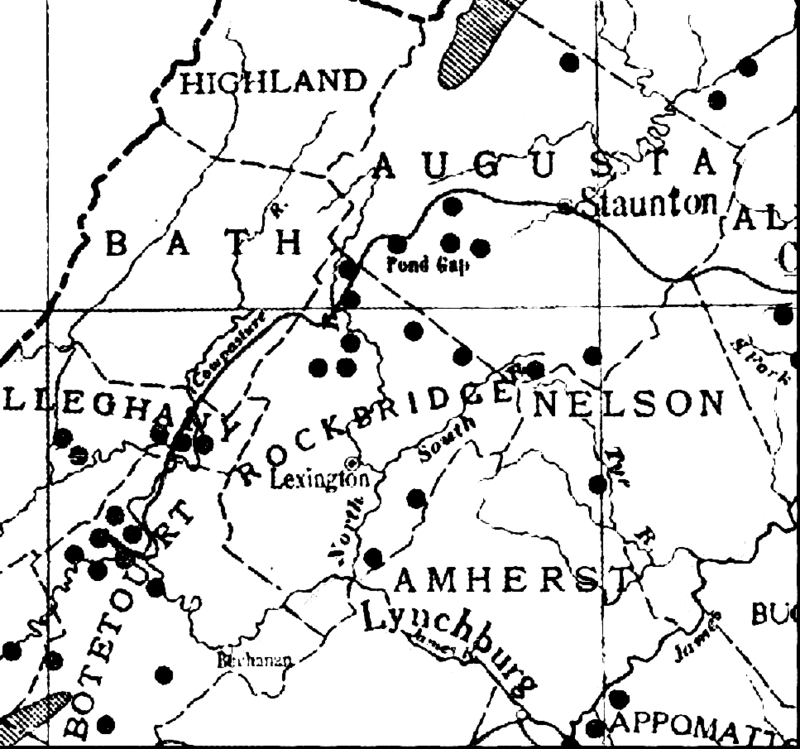 Mines: volume of material, chemical analysis, where slags say ore came from, .... ?were there bloomeries in Rockbridge County, and where? History of Virginia Iron Manufacture in Rare may say something more about bloomery locations. economic projections/retrojections from physical remains... reconstructing ore/charcoal/etc. supplies and processes. Experimentation --up to and including floating iron down the river to Tredegar Iron Works, first time in 130 years... batteau festival tie-in? one of the furnaces working during WW I? So James Heppner thinks. barr to be made of it. flat iron bar..with two square rough knobs, one at each end. them under the forge hammer into anconies. 1. `A mass of iron after having undergone the first hammering.' Weale. spec. An ingot of iron or steel, or a pile of puddled bars, which has been brought, by passing through one set of `rolls', into the f orm of a thick bar, and left for further rolling when required for use. A. 1000 In Wr.-Wülcker Voc. 141/36 Massa, dad, uel bloma. 1674 Ray Iron Work 127 At the Finery by the working of the hammer they bring it into Blooms and Anconies. 1679 Plot Staffordsh. (1686) 163 They work it into a bloom, which is a square barr in the middle, and two square knobs at the ends, one much less then the other, the smaller being call'd the Ancony end, and the greater the Mocket he ad. 1719 Glossogr. Nova, Bloom, in the Iron-Works, is a four-square Mass of Iron about two Foot long. 1845 New Statist. Acc. Scotl. VI. 79 An extensive forg e for the manufacture of blooms was erected. 1862 Times 12 Aug., Lord Dudley presents numerous specimens of fractured blooms and bars. 1881 Academy 6 Nov. 350 It m ay possibly be a `bloom' from a prehistoric foundry. 1882 Engineer 24 Feb. 133/1 The blooms from the hammer are then heated and rolled down to make puddled bar. 2. Sometimes improperly applied to the `ball' or mass of iron from the puddling furnace which is to be hammered or shingled into a bloom. 1865 Derby Merc. 15 Feb., An immense bloom of iron, looking like a huge egg, and weighing 5 cwt., showing the state of the iron as delivered by the furnace. 1875 Ure Dict. Arts II. 1013 The bloom or rough ball from the puddle-furnace. 1879 Cassell's Techn. Educ. I. 410 After pig-iron has been puddled, the `blooms', as the masses of iron are termed, while still white-hot from the puddling furnace, are dragged to the helve. bloom-smithy, a forge or smithy where blooms are made. 1601 Holland Plin y I. 459 This kind of charcole serueth only the Bloom-smithies and furnaces. 1831 J. Holland Manuf. Metals I. 18 At the suppression of the bloomaries (or iron smithies) the tenants charged themselves wit h the payment of this rent, which is called Bloom Smithy, or Wood rent. 1884 Imp. & Mach. Rev; 1 Dec. 6719/2 A large bloom-shearing machine, capable of cutting steel blooms. I made a search for literature on iron in GeoRef and found about a dozen sources that seem to summarize what's available. From Bining 1973, who got it from Diderot, section on "Forges ou art du fer" [REF AE25 .E53 vol 4, pp 319-346]: Still further: the plate caption for this illustration identifies the ancony as encrénée, which is not to be found in any of the French dictionaries I examined. A large collection of John Hower's articles on the Lebanon Valley PA offers many other items of interest. Following a lunch with VMI folks to discuss an iron-making project, I did some hunting for designs of small-scale blast furnaces. Nothing definitive has turned up yet, but I did find [via a search for 'bosh near iron'] a good summary of iron smelting at Oswego, OR that's pretty complete, and another document from the same source on the smelters themselves. The question I'd LIKE to find an answer to: how readily can a blast furnace be scaled down to a practical size for the experiment VMI has in mind --or, to put it another way, how small can a blast furnace be made and still work? How much refractory brick? How small a chamber? What sources for blast? A working design would be very helpful, but so far none has turned up. The traditional Chinese iron industry and its modern fate (Donald B. Wagner) There's a diagram of a Great Leap Forward small-scale blast furnace. The question for the VMI folks would seem to reduce to: how small a furnace would be capable of reaching the temperature of 1800 degrees C? What combination of furnace materials, insulation, and air supply would be required? Historical charcoal-fired blast furnaces were not small: Alexander and Street (Metals in the Service of Man, 1976) describe an English example "6 metres high and 2 1/2 meters square on the outside; it could produce 6 tons of iron per day" (see Backbarrow Ironworks illustration, a a related General State of Industry - Coal-Mines and Iron-Works). TITLE        Cloud by day, the story of coal and coke and people. PUBLISHER    Chapel Hill, Univ. of North Carolina Press, 1947. SUBJECT      Coal miners -- Pennsylvania.